Making Finnbarra is Daniel Emmerson’s passion. After being presented with a traditional apple press by his Father in Law on his wedding day, Daniel dedicated himself to cider making. From pressed apples, fermented with a little Champagne yeast in Nohoval, County Cork, Ireland. The apple varietals are fermented individually & then carefully blended. More unfermented juice is then added back to bring the required sweetness back and the alcohol gravity down. Strong fresh apple aroma & vibrant apple taste. Delivered with a mild effervescence & golden hue colour. Blended from Dabinett, Michelin, & Elstar / Falstaff apple varietals. Far crisper than its medium dry sibling, it has a rich bronze colour with a hint of caramel finish. Drawing its character solely from the Dabinett & Michelin varietals. 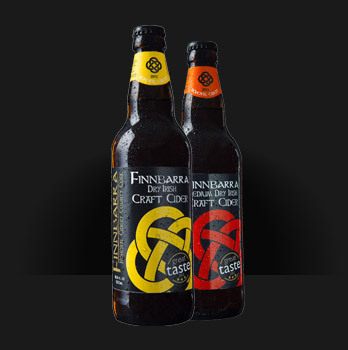 Both ciders were individually awarded 3 Gold Stars at the Great Taste Awards, & were both ranked in the Top 50 products from over 10,000 entries. 2014 British Bottlers Institute Competition Gold Medal, Medium Dry. On the 12th of March 2014, we were awarded the Irish Food Writers’ Guild’s inaugural Drink Award. Now in its 20th year, the Irish Food Writers’ Guild (IFWG) Food Awards recognise and reward producers of the highest quality food, together with industry stalwarts who devote their lives to supporting and promoting Irish food. Both ciders were awarded three gold stars and were named in the list of ‘Top 50 Products’ from over 10,000 products entered. In addition we were awarded a 'Golden Fork Award' for 'Best Irish Speciality Food and Drink'. Great Taste, organised by the Guild of Fine Food, is the acknowledged benchmark for speciality food and drink. It has been described as the ‘Oscars’ of the food world and the ‘epicurean equivalent of the Booker prize’. Quite simply the Great Taste logo is the sign you can trust when buying food and drink in your local, quality retailer. Winning is important to the producers as it differentiates their products from the norm and means you, as the customer, have a guarantee that the products you buy have a reliable seal of approval based upon great taste and not marketing. The McKennas' Guide Plaque is the most respected badge of merit in Irish contemporary food. Awarded only to those who are described in the McKennas' Guides, the plaque is the ultimate signal of culinary creativity and imagination. sales@trilogybeveragebrands.com All content is owned by Trilogy Beverage Brands Ltd 2014.